Great Websites to help your children learn how to or practice their writing! Font Space: Site with various forms of print from beginner to cursive writing. Choice the font you want and then customize the text and print! Great way to teach your child how to write their name or practice a favourite scriptural memory verse. That Resource Site: This is an amazing website my friend Karolina shared with me- they have pages from A- Z for kids to use to practice their writing in print or cursive; as well as scriptural quotes from saints with their pictures on the page. I printed all the letters from A-Z and some of the Saint Pages and put them in a duo-tang – I had my daughter read each word to practice her phonics and then had her write the words out. She loved doing these sheets! The rest of the website offers great homeschooling resources too! We’re going to work through their vowel word-lists next! 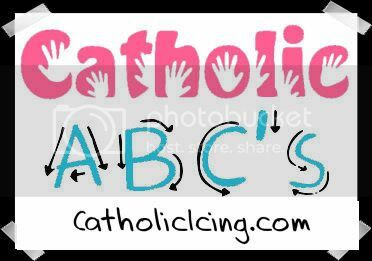 CatholicIcing’s – Catholic ABC’s – Offers a free weekly Catholic home-school curriculum for preschoolers. It is designed to help your preschooler learn through the bible, help them with routine, she has crafts for their fine motor skills, and covers numbers 1-5, every letter in the alphabet, and many saints and Catholic prayers. Thanks for your marvelous posting on home schooling! I seriously enjoyed reading it, you could be a great author. I will be sure to bookmark your blog and will often come back someday. I want to encourage that you continue your great writing on the importance of education, have a nice morning! Thanks for the marvelous posting on home schooling! I quite enjoyed reading it, you might be a great author. I will ensure that I bookmark your blog and will eventually come back at some point. I want to encourage one to continue your great writing on the importance of education, have a nice evening!